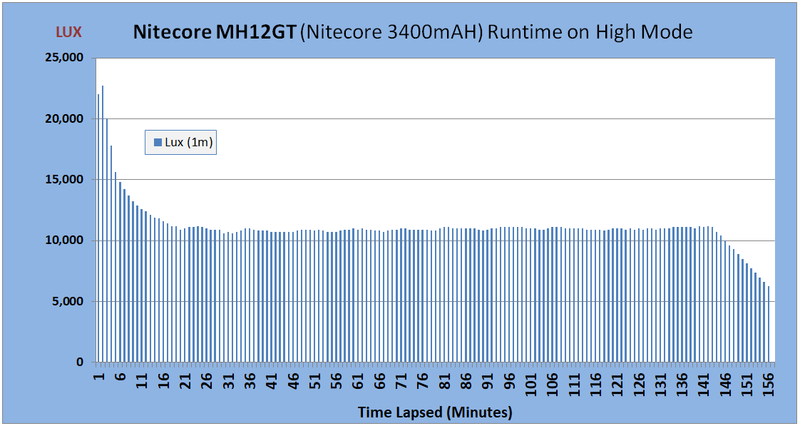 This review will explore the newly released Nitecore MH12GT. 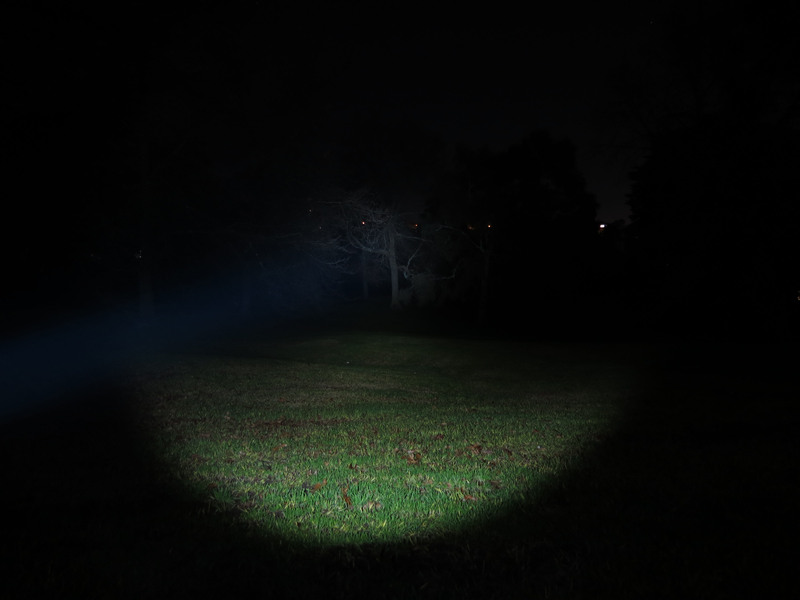 This is medium sized flashlight powered by a Cree XPL HI V3 LED that with either a 18650 or 2xCR123 batteries. Coming with it's own inbuilt USB charging feature it's a convenient overall package. As Nitecore is recognised as a very high quality manufacturer we should expect that this too is a top performer. This is my second Nitecore flashlight, having owned another model for a few years I appreciate the quality and performance of their products. Thanks to Banggood for providing this flashlight for review. Ultilizes a XP-L HI V3 LED. Power indicator can also report battery voltage to the nearest 0.1v. The box is simple, nothing too exiting here however it provides a clear description of what is a feature packed product. The box labeling clearly displays what on offer. The box isn't very durable, just basic packaging to enclose all the included items. Not the type of box people would retain to store the flashlight away, but otherwise fine. Although not a durable box, the contents were not damaged in transit. Next we have the contents of the package. Lots of fine accessories included. This is more than normally expected for a flashlight, however the premium pricing results in higher expectations. Also included but not seen in the image is 3400mAH battery. It was included in the flashlight. The battery is approximately 69mm in length, and is a protected cell. The small plastic bag holds a number of items as shown below. All good quality. Below is the flashlight case. Quite compact but works very well. The flashlight fits snuggly in the case which can be attached to a waist belt or a carabiner. The flashlight was in perfect condition, without any scratches or dents. The host length was measured at 140mm and weight at around 90 grams. The images below of of either side of the MH12GT. The first shows the side of the head sections with the rubber covered mode button is located. Also seen is the NITCORE printing on the body, along with other printing. The flashlight can tail stand. The side button is covered with a black rubber protector and has the "MODE" imprinted. The button is quite firm and feels good. 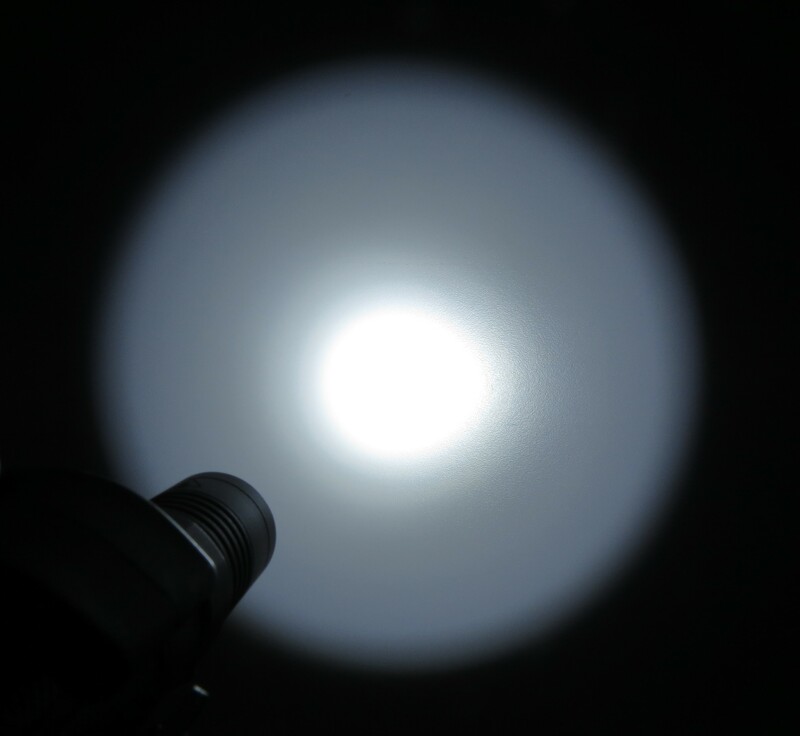 A closer look at the reflector and Cree XPL HI LED. The reflector is smooth and not very shallow which would assist with its throwing ability. The glass reflector is coated. Below is a photo with the USB port cover unplugged. The rubber stopper does the job here however it could easily be removed or damaged if not careful. On a positive note if this were to happen the package does include a spare cover. The close up photo below of the threads at the tail end of the flashlight. The threads are not sharp and are nicely lubed. There is also an O-Ring to assist with the water proofing. The anodisation is top class here and specified as HAIII. The knurling of body results in a good finish, somewhat smooth, but not enough to make it easily slip out of your hand when held. An inside view of the tail cap. There are actually 2 springs, the outer one and another inner. The flashlight can lockout. Bottom of the tail cap is a black switch cover. The button works well and is firm to press, has a quality feel about it. The tail cap also has slots for a lanyard and can tail stand. Photo below of the mid body section and a view of the positive terminal of the head section. No spring here but it can still accommodate flat button battery cells without an issue. Both ends of the body contain O-rings. Size comparison between the Nitecore MH12GT and 4 other 18650 tubular flashlights. The MH12GT (left most) is one of the longer/taller flashlights here but would still be considered compact enough to be classed as an everyday carrier. It's not a bulky flashlight that fits nicely in hand. The supplied 3400mAH battery is shown next to the flashlight. The supplied clip can be attached to the flashlight body. It's a good design that does the job. A view of the other side of the flashlight. The end sections of the light clip that wrap around the host body are small which is a good design. Below is a scan of the English Sections of the supplied folded up manual. All details clearly included describing all features and usage of the flashlight. The other sections of the manual including warranty details. Overall the beam pattern is really nice. There is defined hot spot with an even spill. No rings visible. The mode spacing is very good too as there is nice spacing between each mode. The tint is at the cooler end of the scale with minimal if any discoloration around the hot spot. 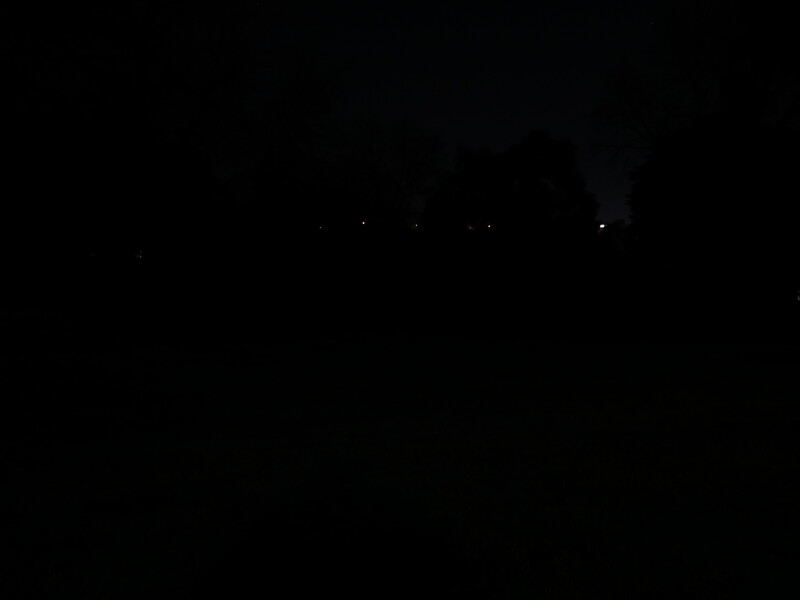 Location is at a park with the distant tree approximately 60m from the camera position. Being only 1 Lumen in brightness in this mode, no real impact. Although only 55 lumen we can make out the tree in the distance. On medium the output level is very usable and very good. 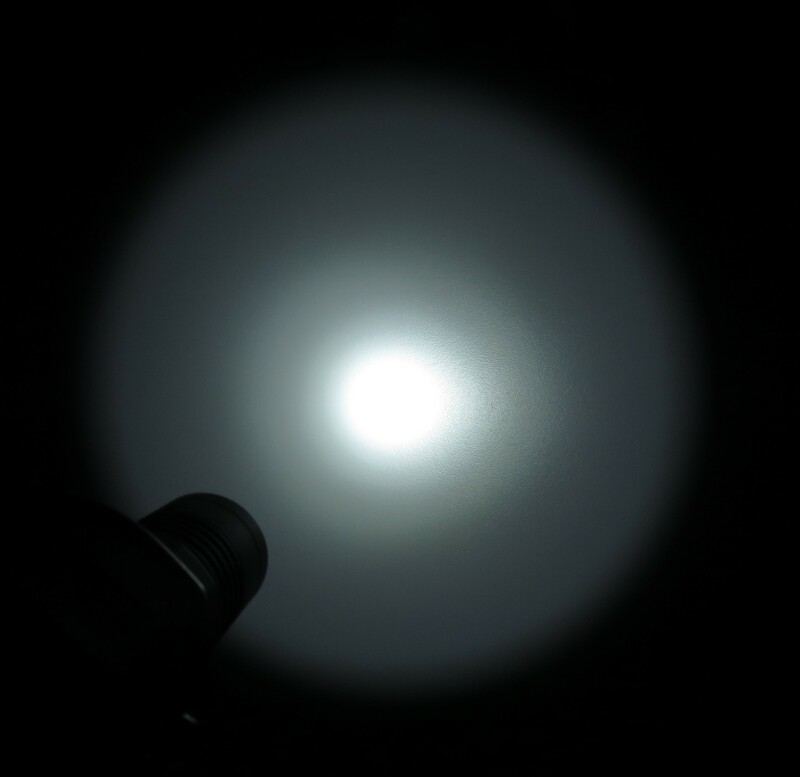 The flashlight being a XPL HI has a decent hot spot but also produces a good level of spill. 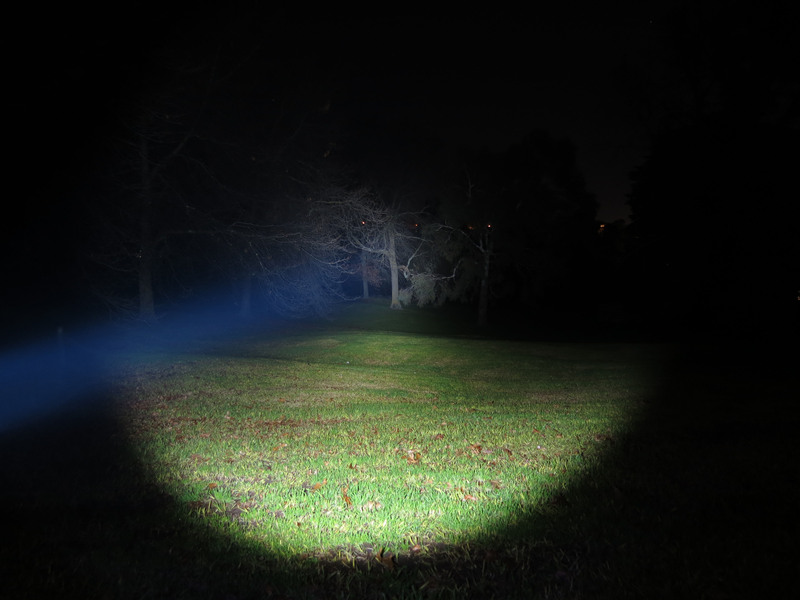 On the highest mode of around 1,000 Lumen the performance of the flashlight is excellent for its type. The throw range is specified at 320m, and we see in this photo a target 60m is well lit up. The beyond the hot spot the rest of the beam pattern produces a broadly lit up area. The flashlight has very good throw for it's size and design but is still able to provide a good level of flood. Firstly the Ceiling Bounce test. The purpose of this test is to assess the amount of light produced. The score 63 is slightly lower than comparable tubular designs of this type however is still very impressive. Next is a run time test using a freshly charged 18650 Nitecore 3400mAH Li Ion battery as was supplied in the package. All run time tests were executed with the flashlight mounted in a tripod spaced 1m from the light meter sensor. The flashlight and sensor were stationary for the full duration of the test. A video recording device was used then to record the session with all results recorded transferred to a spreadsheet for charting purposes. The run time test until the flashlight turned off, which was after approximately 156 minutes. Overall a very good runtime with a consist stable output. As the battery charge starts to decline a blue LED in the mode button section emits a blue light. The Blue LED flashing frequency increases as the charge on the battery declines. This serves well as a visual form of low battery voltage warning. 1. A peak of just under 23,000 Lux. 2. 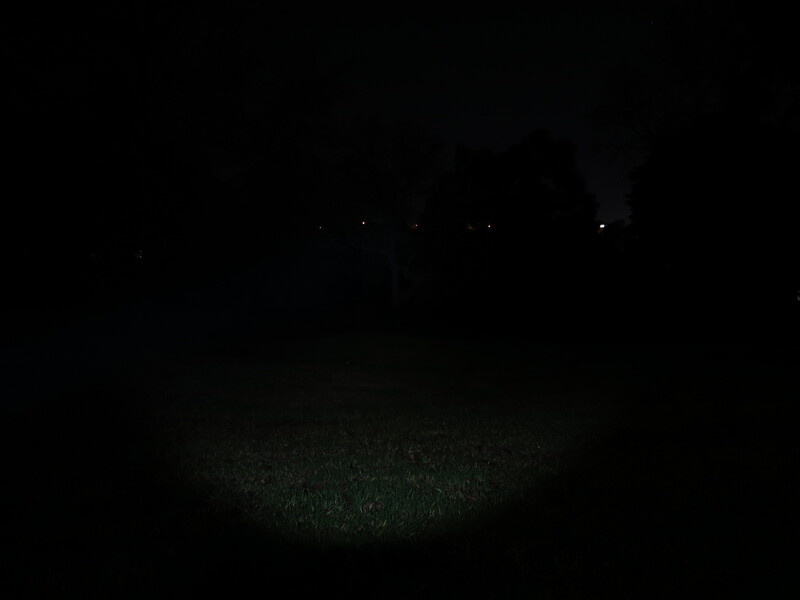 After approximately 3 minutes the flashlight mode changed to Medium, where the light output gradually dropped to just under 11,000 LUX. At this level it remained relatively constant for the next 2 hours! 3. After the 140 minute mark the brightness dropped off in a linear fashion to the 156 minute point where it's dropped to only 20 Lux. A closer view of the data for the first 15 minutes along with temperature measurements. Thermal management is excellent. The controlled tests suggest that the maximum temperature measured did not exceed 34C, where the ambient was 19.5C The highest temperatures being measured at the head of the flashlight so no concerns on the ability to hold the flashlight in hand at that time. With the flashlight equipped with the supplied Nitecore 3400mAh battery the following measurements were recorded. The medium current reading surprised me but I repeated the tests and scored the same result. Tests were not performed with CR123 batteries. To turn the flashlight on, the tail end button needs to be pressed until a click is heard. To turn off simply press the same button in the same manner again. Aside from these modes there are hidden modes. These include strobe, SOS and location beacon. The location beacon is a mode I've not yet come across and could be very useful for some in times of emergencies. To access these modes requires that the flashlight be on. With the flashlight on, press and hold the side mode button for just over a second. This will activate strobe mode initially. To then cycle to the SOS hidden mode, again press and hold the mode button for just over a second. Repeat to enter beacon mode. There is also a momentary on mode. Simply depress the tail end switch halfway. Whilst holding the switching in the half way point the light turns on. Upon release it turns off. The flashlight has Memory mode for last active mode. Battery charging was performed on a supplied Nitecore 18650 Battery. To enable charging the rear tail switch must be on. The initial charging current measured via the USB charger feeding the flashlight with approximately 0.53A at a voltage of 5.20V. The total charge time was approximately 7 hours, with a measured battery terminal voltage of 4.17V. The internal charger function works well although as per the results, with a charge current of around 0.5A many hours are needed to fully charge a battery. The Nitecore brand is highly respected with numerous high performing and very popular products in their range. The MH12GT is yet another example of great performer. It's far from being a budget product with a price tag retailing in excess of $US80, but like most items, you pay for quality. It's a well designed flashlight that works really effectively. In using the flashlight for over a week for early morning walks I have found that that beam profile provides more than enough flood to have a clear view of the path ahead, and where needed the ability of the flashlight to throw upwards of 320m allows for lighting targets that are a reasonable distance away. It's an ideal balance between throw and flood. Overall an excellent premium flashlight package. The Nitecore MH12GT offering comes well equipped with a Battery, a case and other accessories that make it a great choice for people seeking a high quality performance EDC. Again thanks to Banggood for providing a model to sample. > Includes a high capacity Battery! > High is only active for a few minutes before dropping to medium mode. Another con: It doesn’t maintain high output. Dealbreaker. Thanks for your comment as it’s always interesting to learn of people thoughts. It remains on high for a few minutes which is more than some, clearly Nitecore are being conservative with heat management. The level it drops down to is very good and given the beam profile it’s a very usable and useful level of output. Nice, i was thinking of getting one because of the USB charging. I really like the USB charging on my R40, way more convenient than taking a charging base or external battery charger everywhere, just need one cable. The fact that it isn’t able to maintain the output is normal for a light this size, it simply can’t deal with the heat. However Nitecore says it has “Advanced temperature regulation” but looking at the runtime graph I don’t see any sign of temperature regulation, just a normal step down after the first few minutes and the temperature is maintained at 34C because the output is fixed at ~50%. A true temperature regulation should have notable zigzags in the output like what we see with zebralights, klarus and armytek. I could be wrong though, and the only way to truly test it is by submerging it in water, if it maintains flat output close to the initial output then the temperature regulation is there. dont you see the zigzacks in the temperature? This is why I don’t think there is really any active regulation, it stays at 34C because the ambient temp is rather low at 19C. A true active regulation would change the output and keep the light at certain temperature regardless of the ambient temp. A preset thermal regulation would just set drop the output to certain point even if the light is cool to touch. Now, I don’t know if the temp ceiling is set at 34C, if so then it is truly limiting the performance. If I had one I would test it partially submerged on water and compare it with the non-cooled output graph. If it was a preset regulation it would drop the output instantly, like a turbo timer. This just seems like thermal regulation with the threshold set very low. That is why it is an exponential curve decrease that flattens out. It says on the manual that when charging the blue light blinks every second and will go off once charging is through. I guess my question is what does that steady blue light mean?.. As a review, overall the flashlight’s great. I got it as an edc all-rounder. I might however need to get a smaller one to carry when jogging, i’m afraid it will pop out of my pocket due to either its weight or size. Don’t get me wrong though the weight on hand is perfect, not too light to feel flimsy and not too heavy to feel any strain when using it. Probably just not the best tool to bring when running. Throw is great it seems to perform as promised. As with some reviews i came across, though not that many yet for this unit, it says that its more floody than a thrower. It had no problem illuminating a good 15sqm room better that the rooms ceiling light. Had it turned on for more or less 10 minutes, it seemed to hold its brightness for the duration and did not shift to medium. Then again all i used were my eyes, i did not have any tool to do any exact measurements on performance which i am sure the initial data had. Its been with me for only 2 weeks, and last night was the first time i charged it. I was surprised with the battery run time. Its the first “real” flashlight i purchased. took some time comparing runtime and performance charts of other units and brands before finally making the purchase and i guess an hour and a half isnt a short time depending on the usage after all. In total i’m pleased with the purchase and would recommend it.